Dayal S. Reddy is solo practitioner with several years of experience handling a wide array of legal matters for his clients. His practice focuses on general litigation matters across various areas of law, including civil and criminal matters, discrimination, employment law, business litigation, personal injury, appellate law, criminal appeals and more. When approaching his clients’ legal needs, Dayal works closely with clients to identify the real issue causing his clients’ so much frustration, and then helps clients to develop a comprehensive, streamlined solution for addressing his clients’ needs. Dayal is not afraid of a tough legal challenge and he diligently works to preserve and protect rights of his clients. 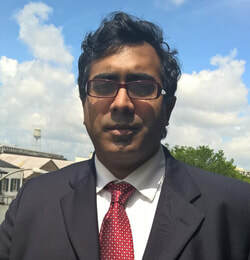 After working for civil litigation firms in New Orleans and serving as a student practitioner with the Orleans Parish District Attorney’s Office while in law school through the Loyola Law Clinic program, Dayal began a practice in which he could more directly and effectively assist clients in identifying their legal needs and addressing those problems with an affordable, client-tailored, and sometimes creative solution. Dayal has a penchant for legal problem solving, and derives energy and enthusiasm from the successful resolution of his clients’ legal difficulties. In addition to his law practice, Dayal's other activities include things like active involvement in a number of professional associations, organizations and the community. Dayal serves as a board member for the non-profit organization the Bayou Treme Center for Arts and Education. He is also an F.A.A. certified private pilot, certified scuba diver, and speaks fluent Telugu. Dayal Reddy is admitted to practice law in Louisiana, Texas, and the federal Eastern District Court of Louisiana. Dayal Reddy serves clients across Louisiana and Texas, including Orleans Parish, New Orleans, Jefferson Parish, St. Charles Parish, St. Tammany Parish, Tangipahoa Parish, St. Bernard Parish, Plaquemines Parish, St. John the Baptist Parish and Lafourche Parish. WEB DESIGN BY CYBERIAD SOLUTIONS. ALL RIGHTS RESERVED.